With certain production processes its necessary to ionize at such a long distance where classical AC anti-static bars aren’t sufficient enough, for example winding and rewinding of webs where the diameter of the re-windingsection changes continuously. Also with bagmaking machines type Wicketer it’s necessary to ionize from a long distance as moving machine parts hinder short range ionizing. With the ThunderION a new technique is being used were long range ionisation is possible without air support, as transportmedium for the ions. The ThunderION is a revolutionary development in both design and functionality. It offers long distance static elimination even up to one meter. The robust design of the reinforced extruded profi le allows the use in industrial environment up to even 4 m length. The slide slot on the backside of the ThunderION enables the user to position the mounting screws as required, allowing greater mounting fl exibility. The disc shaped emitters differ from the conventional emitters. They produce a high and balanced ion output. When accidentally damaged they can easily be replaced. 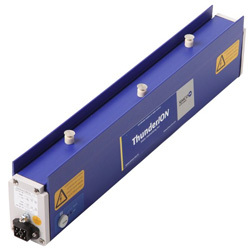 The ThunderION has an integrated high voltage power supply and requires only a low voltage input of 24V DC. The new concept for long range ionisation is achieved with a combination of pulsed DC and a low frequency. 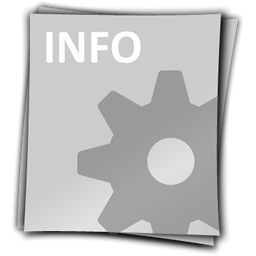 These features are the main difference with classical AC ionizers. Two LED’s visualise bar ON or bar FAULT. An incorporated overload detection will temporarily switch off the high voltage in the event a short circuit may occur. Optional is the Control Module, the ThunderION Control Module provides the power and the control for up to four ThunderION anti-static bars.